Public awareness of the warning signs of childhood cancer is vital. Currently, between 800 to a 1 000 SA children are diagnosed with cancer annually. However, it’s estimated that half of the children with cancer in South Africa, are never diagnosed. International Childhood Cancer Awareness month is celebrated in September each year. Gold ribbons are worn to help raise awareness worldwide. This is due to a lack of knowledge regarding the disease and how it presents in children. As a result, many children are diagnosed too late, when the cancer is already in an advanced stage, thus diminishing the possibility of successful treatment. Cancer stigma and myths are rife, especially among certain local ethnic groups. These result in not wanting to acknowledge that a child may have cancer, because of the risk of being shunned or believing that cancer treatment won’t be effective, because the cause is not medical, but supernatural. Myths surrounding childhood cancer need to be debunked to ensure that children are referred to specialists without delay. According to the South African Medical Journal¹ the overall survival rates for childhood cancer in South Africa remain low, when compared to international data. Greater awareness of the warning signs of childhood cancer can encourage earlier diagnosis and lead to improved outcomes for all ethnic groups. Many childhood cancers are treatable with high treatment success rates between 70% and 80% in well-resourced countries, while approximately 80% of children with cancer in Africa die without access to adequate care. Whilst South Africa has an established oncology healthcare service, the infrastructure is overburdened, the cancer awareness in the primary healthcare service is poor, and widespread service delivery challenges exist. The causes of cancer in adults are also usually attributable to lifestyle choices, whereas in children, genetic and environmental factors play a dominant role. 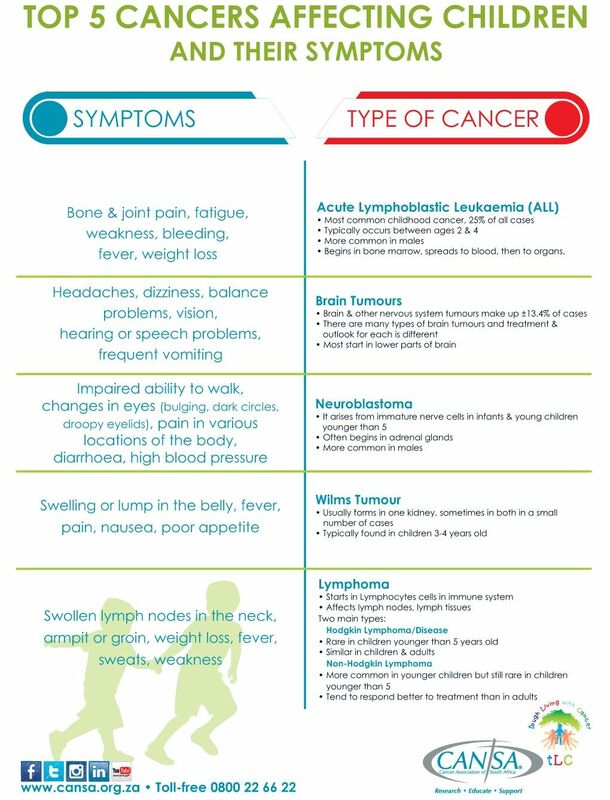 It is important to note that there is a vast difference between childhood cancers and adult cancers, because children are still subject to growth spurts within a short period of time, which may result in the cancer spreading faster and more aggressively. This implies that treatment or advice that may work for adults, will not necessarily work for children. Cancers in children tend to be different from those found in adults, with most of them often occurring in the developing cells such as bone marrow, blood, kidneys and nervous system tissues. Our CANSA TLC Programme provides support to children / teens & parents affected by cancer – please contact Cara Noble, email: cnoble@cansa.org.za should you have any queries or require support.